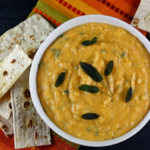 Perfect Butternut Squash Dip with Sage. Winter squashes like butternut squash are full of beta carotene, vitamin C, folic acid, antioxidants, and niacin that offer a lot of brain and body health benefits while adding few calories to your diet. If you are a woman going through the unpredictability of menopausal flushing and sweating, then you need to know about sage. Incorporating sage into your diet every day will help reduce that flushing and sweating dramatically. I know, I’ve tried it and I’m here to tell that it really does work. 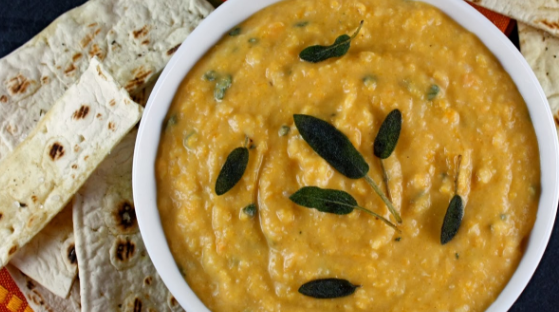 Purée the butternut squash and place into a saucepan. 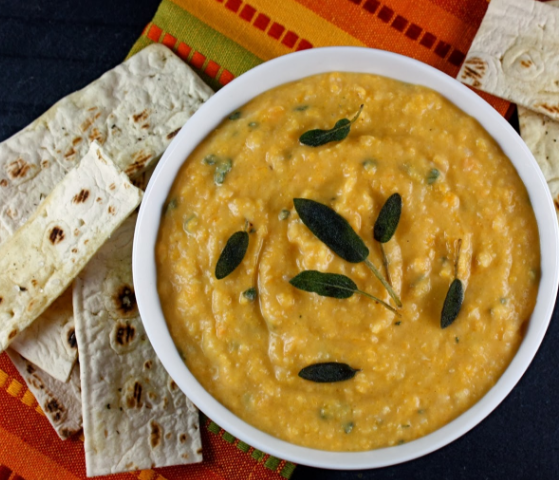 Over a low to medium heat, add the hummus, orange zest and juice, salt, paprika, pepper and half of the sage leaves. Heat the mixture enough to just lightly warm it. Add the cheese and stir it in. Place the dip into a serving dish/es and drizzle with the oil before serving.